You know me, I love a good cleanser and toner combo and what better way to celebrate World Vegan Month this November than with a Vegan Society registered skincare routine from online eco retailer, Big Green Smile. The Lavera Gentle Cleansing Milk is a creamy cleanser but it isn't thick - just thick enough to stay put on a cotton pad. It is a very mild cleanser so is suitable for sensitive skins; I've found it effective at removing the general grime of the day from my face but I've yet to give it the challenge of a full face of make-up. The active, soothing ingredients include organic almond milk and organic mallow flower. I like it, its everything I look for in a cleanser and, combined with the Lavera toner, makes a perfect first step in my daily cleansing routine. This cleanser currently costs £7.50 at Big Green Smile for a 125ml bottle. The Lavera Purifying Facial Toner is intended for oily to combination skin but I think it is gentle enough to use on most skin types. This toner is packed full of ingredients known for their soothing and cleansing properties - ginkgo bilbao, witch hazel, aloe, grape and calendula. It has a soft, planty scent and leaves my skin feeling gorgeous afterwards. A great toner like this always leaves your skin feeling a little tighter than normal after its astringent properties (probably the witch hazel in this case) closes down the pores to protect against dirt. 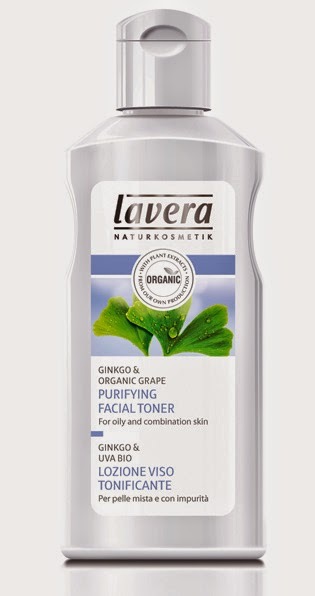 Lavera Purifying Toner currently costs £7.90 for a 125ml bottle at Big Green Smile. If you are looking for vegan-friendly skincare products then Big Green Smile have a whole host of products from moisturisers and make up through to toothpaste and deodorant. There are also lots of cleaning products in the Vegan Society registered range of products that includes soap, laundry detergent and dishwasher powder.